Pages etc. : 244p., full of col. illus., gloss., bib., 32cm. 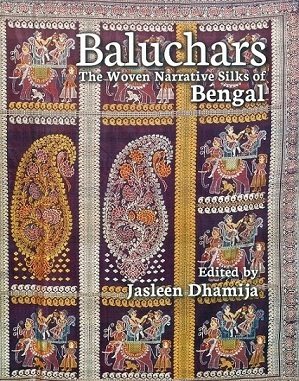 This richly illustrated book traces the historical development of Baluchar textiles, especially saris, and the position this art form has come to acquire in the twenty-first century. By dissecting the conditions, inspirations, materials, techniques and aesthetic qualities of this weaving tradition, this book showcases how this art form travelled from Murshidabad to Bishnupur, then to Benares as well as to museums around the world.